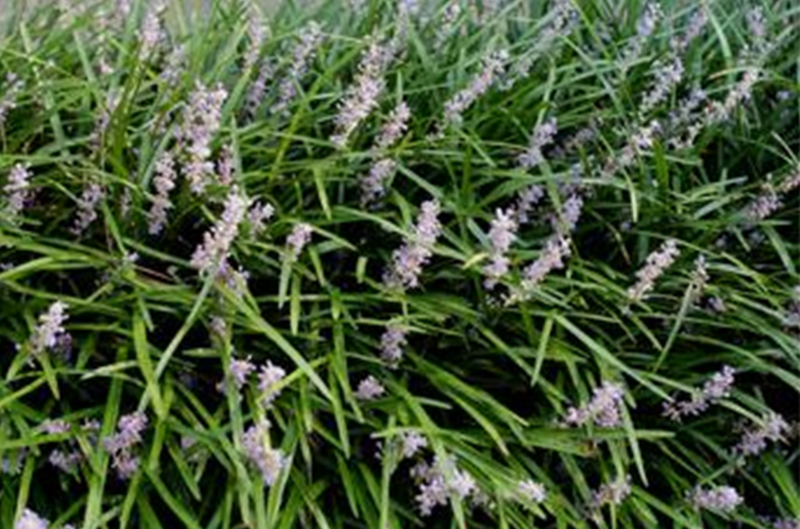 Monkey grass, border grass, lilyturf, or by any other name: liriope is both tough and easy. Tough and easy to grow, there are two basic types of liriope - Liriope muscari and Liriope spicata. Both are grass-like, semi-evergreen perennials that are commonly referred to as Lilyturf, monkey grass, border grass, and blue lilyturf. Pale lavender to white flowers appear among the leaves in late summer on erect flower spikes.pLiriope grows effortlessly in average, medium, well-drained soil in sun or shade. Tolerant of heat, humidity, drought, salt, a wide range of light and soil conditions, Liriope will perform best in moist, fertile soil with part shade. Maintenance is as easy as mow (on a high mower setting) in early spring before new shoots appear. Liriope transplants easily at any time of year. The blue-black berries easily germinate, but divisions are easier and quicker.pLiriope spicata, creeping liriope, spreads quickly by underground rhizomes to form colonies, and can be aggressive. Useful as a dense ground cover to stabilize banks or slopes; and can be planted under shallow-rooted trees, along streams or ponds.pLiriope muscari forms a clump and is widely used as a border plant or as a shade ground cover. Clumps slowly expand by short stolons, but do not spread as aggressively as Liriope spicata.